I can’t believe its Thanksgiving time once again. This year has FLOWN by, hasn’t it? Maybe its the perils of getting older and time doesn’t drag on the way it used to…or maybe its a side effect of a life that is too often spent being too busy to relax and enjoy it. It seems like just yesterday I was gearing up for the first of many first holidays without my mom. It was a tough day…and there have been good and bad days since. This year, I will be spending this day with my father and some family friends at a communal dinner – the gathering of the orphans, in a way. I’m happy to have friends and family to spend the day with. After months of a drought…and a looming water crisis…it rained today. Thanksgiving. Coincidence? I think not. I’ve been blessed with a busy, successful, and creative year of work. I am so lucky to be able to do something I truly love for a living. For my two fuzzy friends, Brumby and Floyd. What would I do without the cat barf and the purring vibrating pillow at night? Sleep better…but I digress. My friend are amazing. They are my family, my heart, my belly laughs. It’s a very selective group…and I like it that way. I surround myself with good people. This blog. I’ve said it before…and I’ll say it again: I feel so lucky to be able to have this blog…to have a voice that reaches further than I would have ever imagined…to meet wonderful & talented people from across the globe. This blog and the people involved in the food blog world inspire me. During my week of cooking, I wanted to make something that I could share with my friends that might have other plans for the holiday. Since I wouldn’t be able to spend it with them, I wanted to share a part of me with them. I made this Chocolate Chip Pumpkin Bread in small loaves and gave them away. It’s absolutely divine (once I realized that the recipe was all wacked out with left-out ingredients and I had to troubleshoot it, that is). It’s the most not dry, flavorful pumpkin bread I’ve ever had. I also made a version with the new cinnamon chips, which was awesome as well. Beat eggs and sugar together. Add oil, water and pumpkin to egg mixture and mix flour, soda, salt and cinnamon together and add to pumpkin mixture. Stir in as many chocolate chips as you like (6 to 12 ounces). Pour in 2 or 3 greased bread pans and bake at 300 degrees for 1 1/2 hours. Perfect timing! 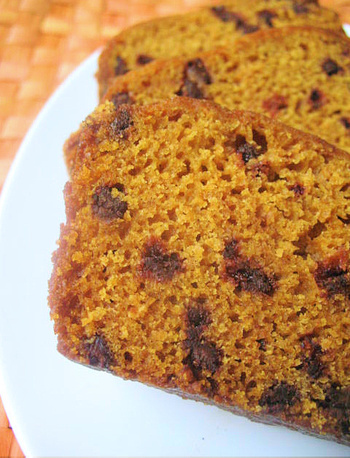 Pumpkin bread is on my ‘to do’ list for the weekend! Have a lovely Thanksgiving…and I understand about the cat barf – except for me it’s dog…. Happy Thanksgiving Tammi. I lost my Mom and Father over the past few years and it is hard ,especially at holidays. But you have the right attitude which contributes to your happiness and success. You weren’t kidding about the cooks.com recipe and left out ingredients…..I wonder how apple sauce would work for moistness? Is there any alternative for the 1 c. oil? I LOVE PUMPKIN and CHOCOLATE together…. I love pumpkin during the holidays…it is such a comforting flavor especially coupled with the spice of Cinnamon, allspice and nutmeg. I just recently tried a pumpkin recipe as well. I never thought to mix pumpkin and chocolate together…it sounds really good! Have you ever tried to putting more spice in this recipe? Nutmeg and Allspice maybe? This has become one of my favorite holiday recipes! Thanks for posting it! Could you possibly mean 2 TEAspoons of soda, as opposed to 2 TABLEspoons?